On May 24, 1869, ten men in four boats left Green River, Wyoming to explore one of the last unmapped areas of the United States: the Green and Colorado River systems and the Grand Canyon. Three months later, six men and two boats came out of the canyon, making their way into history. This expedition, led by Major John Wesley Powell, has become one of the most important events of exploration in the West. Filled with hardships and peril, the expedition accomplished what was perceived to be impossible. In 1964, the U.S. Bureau of Reclamation commissioned artist William Dean Fausett to record the pioneer spirit of Major Powell and the majestic grandeur of the country he explored. 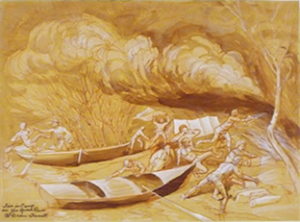 Fausett’s sepia drawings provide a captivating look into the Powell expedition. Born and raised in Price, Utah, William Dean Fausett (1913–1998) studied at Brigham Young University, New York’s Students League, and the Beaux Art Institute of Design. He painted award-winning murals in the nation’s Capitol building in Washington, D.C. and his works are represented in many of the finest art collections in the country. Exhibit courtesy of the Utah Division of Arts and Museums.